I'm Mad and I Eat: Who's a Vegetarian? Oh, come on. There are a lot of vegetables on this plate, including a couple of cloves of unpeeled garlic, roasted along with everything else. I'm going to roast garlic cloves every time the oven is on; what a great mouthful. OK, yes, there is a little bit of meat. Pork. Pork belly, to be specific, which means there is a little bit of fat, too. A few weeks ago I had bought a couple of pork bellies to cure for bacon. As time went on, the desire kind of waned. Cranky got nervous about those unused animal slabs, and pushed for a resolution. Throw them away or, or. Wait! Didn't we just watch Jamie Oliver roasting a thwack of meat the other day? And wouldn't that technique work here? We Googled pork belly, and Jamie Oliver's roasting technique was the first hit. Bingo. It was dead simple. Put some veg in the roasting pan, and top them with the scored meat. Cook, cook, cook. (Basically, ignore.) Come back when your kitchen smells wicked, and dinner is ready. Crisp, juicy, smoky (had to air out the house). Lucky I'm not 100% vegetarian. 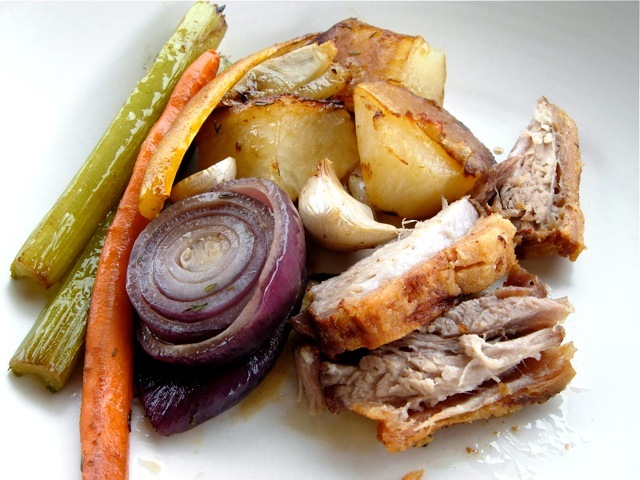 We did something similar last weekend, roasted piggie belly over onions & apples cut in half. Add a few spices, pop in some water and cook, cook, cook - yummy. Some smells I can't wait to clean out of the kitchen--fish, fried anything, burnt sugar, but roast pork is not one of them. I would smear it on my arms and legs if it didn't make me a pariah! Pork belly. Hmm. Can I eat that for breakfast? Why not? No different than bacon. Hey, your food styling is lookin' good in that one, or did Cranky do it? Mouse: Couldn't be arsed. We don't say that in the US, but I will now. I don't think I knew you were a pork belly fan! Brava. Amy: It STILL smells porky and smoky here. If you smeared it on your arms and legs, Bartlett and I would be licking you. Dog: YES. You can eat it for breakfast. It takes a couple hours to roast, though, and it's good hot. You can eat more of it than bacon, because the intense flavor of bacon eventually gangs up on you. Just bought a mound of vegetables for roasting, but like you, not only vegetables. Chicken breast too. It's definitely roasting season. Denise: Promise me you'll throw in some garlic. Roasting season! And we wouldn't even USE our oven a few weeks ago. Now you have me drooling. I'm waiting for some cool weather to do some serious roasting - it's rainy but not that cool. Now, I wonder where I can get good pork belly? Jaime looked like he was getting chunky in that show. Love the guy.Henceforth thwack will be my new unit of measure for meat. Nancy: We can't seem to get the temperature inside the house higher than 62, so a little oven work is welcome. Now, I'd try Ferry Plaza for pork belly. Golden Gate meats might have one (or you could order one), and Prather almost always carries them. Greg: It's a risk of being a chef, I guess. He did look a little puffy. Thwack! Thank you, I was sort of hoping this would go viral. If you have the benefit of a tiny bit of foresight, try curing the belly for a day or four before you roast it. I'm about to order a whole belly for a winter's worth of bacon, but I always save some unsmoked for this sort of application. Cookie, remember it's aRsed not assed:) - as for pork belly, I am a fan of just about anything that comes from the blessed pig! Peter: It wouldn't have occurred to me to cure it first. That firms it up a bit, and this way we got luxurious pillows of luxuriousness. Mouse: ARRRsed. Talk like a pirate!